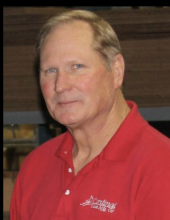 Steve Ray Mesplay age 62 of Webb City passed away on Friday, February 8, 2019 at his home. He was born in Joplin to William Mesplay and Patricia (Bates) Mesplay on March 19, 1956. Steve graduated from Webb City High School in the class of 1974 and graduated from Crowder College with an associate’s degree in 1977. He played high school basketball and also college basketball, was an avid poker player, loved St. Louis Cardinals baseball, wood working and most of all spending time with his family. He worked at Cardinal Scale and retired from there after 43 years. Steve married Cindy (Smith) Mesplay on June 1, 2002 and she survives him at home. He is also survived by his son, Matt Mesplay and wife Andrea of Fort Worth, Texas; daughter, Michelle Mesplay of Oklahoma, Step-Son, Nick Lowry and fiancé Deidre McCloskey of Tulsa, Oklahoma; brothers, Michael Mesplay and wife Donna of Galena, Kansas, Rickey Richardson and wife Cindi of Webb City, Eddie Richardson of Tampa, Florida; a sister, Debbie Pfeiler and husband Rick of Kansas City, Kansas; and grandchildren, Madison, Anderson, Dawson, Layla, Ethan, Eden, Daughtry, Mason, and Easton. Steve was preceded in death by his parents, and his step father, Jack “Bever” Richardson. Funeral services will be held on Tuesday, February 12, 2019 at Christ Church of Oronogo at 10:00 AM. The family will be present for a visitation on Monday, February 11, 2019 from 6:00 PM to 7:00 PM at Simpson Funeral Home in Webb City. Burial will follow services in Carl Junction Cemetery. Services are under the direction of Simpson Funeral Home in Webb City. Visit www.simpsonfh.com for online condolences. To send flowers or a remembrance gift to the family of Steve R. Mesplay, please visit our Tribute Store. "Email Address" would like to share the life celebration of Steve R. Mesplay. Click on the "link" to go to share a favorite memory or leave a condolence message for the family.